In 2004 we made many improvements ranging from the organization of our room to the internal organization of the club. We also gained another advisor, Mr. Plouffe! For FIRST Frenzy: Raising the Bar, we attended the SPBLI Long Island Regional, the Philadelphia Regional and Championships in Atlanta, Georgia. 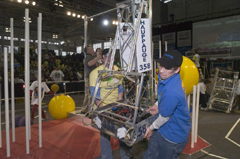 At the SBPLI Long Island Regional we were Seeded 18th after the qualifying rounds. 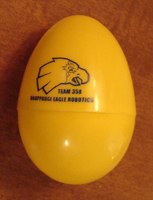 Our thanks go out to the Duct Tape Bandits (team 467)for picking us and to Team 527 Plainedge H.S. for rounding out our alliance. 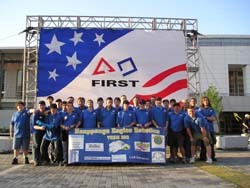 We made it to the semi-finals and won two awards - the Johnson and Johnson Sportsmanship Award for helping Smithtown (team 810) and Malverne (team 884) with their drive trains, helping several other teams with programming issues, and for donating the practice field yet again, and the Leadership in Control Award for our use of just about every sensor we could think of: a gyro, wheel encoders, a banner light sensor as an arm position encoder, IR receivers for the field IR beacon, limit switches, etc. At the SBPLI Long Island Regional the winner of the Outstanding Volunteer Award went to Festo US President Hans Zobel! We'd like to send a special thank you to Hans, and all of Festo for their continued support of our team, direct support of other Long Island teams, of the Long Regional, and of all FIRST Teams with their nifty little Festo valves. 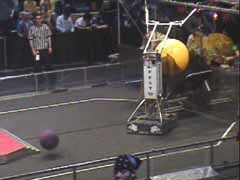 At the Philadelphia Regional an exciting moment occurred when we capped, not the goal, but an opposing robot instead. The drive team decided the strategic thing to do was to drop the big 2X ball into the poor Bobcats (177) open hopper as they waited to catch the small balls as they dropped from above. We got our come-uppance when one of the falling small balls knocked the power connection for our arm loose and we ended up narrowly losing the match. Kudos to the Bobcats for a great comeback. We were seeded 11th and ended up as the 7th place alliance captain. We picked teams	Rancocas Valley Robotics (team 87) and 1113 to be with us. In the quarter finals we had an exciting series with one tie, one win and two losses. At Nationals we advanced farther than ever before. After the qualifying rounds, we were seeded 15th out of 72 teams in the Galileo division. We were picked by the Northern Knights (296) Along with Miss Daisy (341) for the playoffs and made it into the quarter finals. "They could effortlessly cap and uncap any goal, it was amusing in the final match when they and 469 ran around the field capping and uncapping each other's goals." Luckily, high school spring break happened to fall perfectly at the end of the build season, so we invited neighboring teams over to test their designs on our practice field setup in the abandoned high school Commons and we spent a lot of development time there playing with winches and hanging various people, old and new robots from the 10� bar. Our practice field was also provided to all teams at the Long Island Regional. 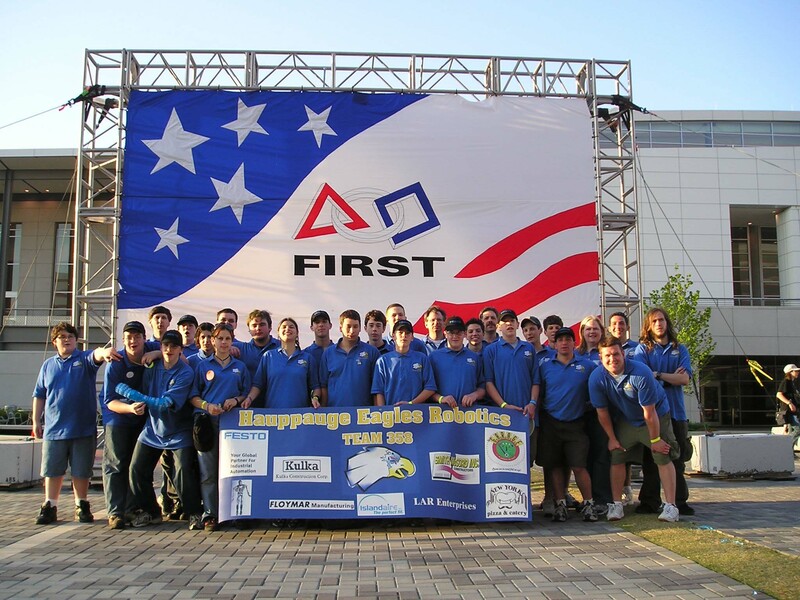 One of our mentors also mentored rookie team 1468 Hicksville and we donated materials and parts as well. Our programmer spent a few afternoons a week at Smithtown through the Fall and build season teaching freshmen beginner programming. An IR workshop for all local teams was conducted the third week of January after the KOP release to get everyone up, running, and understanding the technology involved. The biggest problem with the IR sensors was their sensitivity to static electricity. Lots of them stopped working in testing by the various Long Island teams. This year�s design oversights, issues, shortcomings (there always seems to be something that gets over-looked or doesn�t work as hoped). As always communication is key, especially when agreeing on where the front of the robot is located. The sub-systems were all there as discussed, however, when the mechanical team migrated the goal grabbing hook from the back of the robot to the front they neglected to mention it to the programming group. During autonomous practice the robot proceeded to drive into the starting wall as it was ordered to do instead of towards the goal as we desired. Oops. Not too hard to straighten out except for the fact that the IR beacon detectors were now mounted on the wrong side of the robot to actually see the beacons. Sigh. Our 2X ball handling was optimized for capping the tall stationary goal, and we were very fast and efficient at it. The tower could have been designed better for automatically capping/un-capping the short movable goal. Our real nemesis this year was the hook for hanging. Initially, we decided not to bother with hanging as the 2X ball handling was more important to our strategy. However, with some extra time remaining towards the end of the build period we decided it�d be fun and not too difficult to build a winch and hang from the floor. It wasn�t too difficult and the winch worked out very well, but hooking was largely a one-shot deal that needed a lot of practice to get right. Being on the field floor we were so far from the bar that we added an extension to our arm with a hool on it that would flip out and catch the bar as the winch was activated. If the driver misjudged the distance the hook would miss and we wouldn�t get a second chance. The other issue was being so far below the platform the hanging/winching process to clearly hang above the platform took ~30 seconds. The only real problem with hanging was that it distracted the drivers from following our original game plan. The ability to hang was a big selling point for robots this year though. Our drive team approach got better. Instead of having many people take a turn at driving (and consequently having no one develop a lot of experience) we settled on two principle drive teams. Human players still rotated with the best playing in the Finals. Drivers were Jess Moore, Billy Gerhart, Liz Lanzarone, and ?. Human players included John MacDonald. By the time we finished Championships we realized that we need to pick a single drive team, so they got the most experience, because experience with the actual robot made all the driving difference in the world. Billy's last performance in the Quarterfinals was phenominal, but he could have been doing that well halfway through the season rather than at the very end. 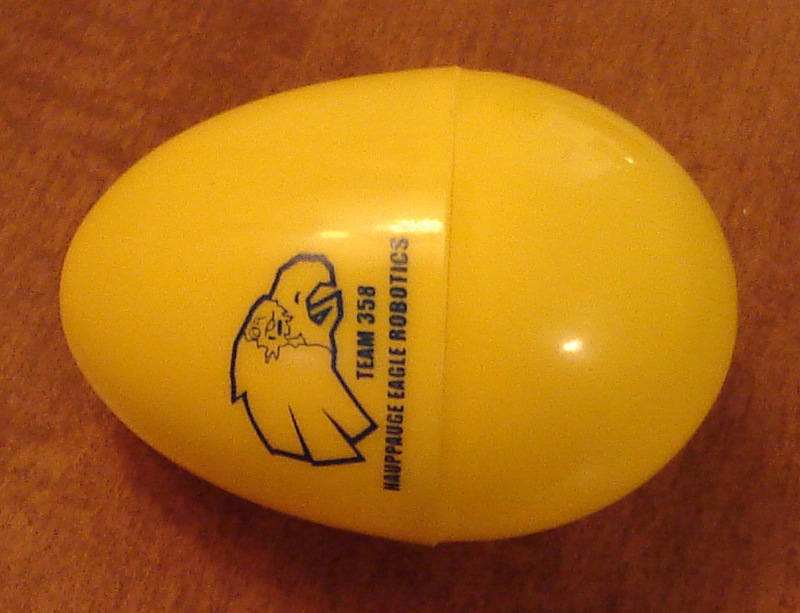 Team giveaways this year were silly putty eggs with our team logo on the eggs. They were very popular with the crowds. Booster Club fundraising ran a Murder Mystery dinner at Dave & Busters in Islandia, one night Oldies concert, and pocket sized school district calendars. What Makes A Good Team Member ?